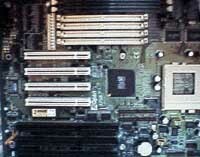 Time and time again AOpen has released stable, fast, and reliable motherboards. The one thing these motherboards truly held in common, aside from the three factors just mentioned, was that they all used Intel chipsets...quite well I might add. One of the most under-rated chipsets out today is the SiS 5582 chipset, it is a great low-cost alternative to the Intel TX chipset, and because of its price point and extensive feature set it is much more of a competitor than a measly alternative. The first example of the power of a 5582 board on this site was the Chaintech 5SIM, while the 5SIM is great motherboard it was still lacking in a few areas...it is those areas that AOpen's first SiS 5582 motherboard, the AP58, excels in. "Find what the people want, and give it to them...at a cost." The driving force behind successful businesses, Find what the people want, and give it to them, what makes the business successful is the amendment to that statement, "at a cost." Keep that in mind as you take a look at the AOpen AP58. AOpen's AT form factor AP58 places the Socket-7 IC at the front of the motherboard (the edge closest to the front of your case) surrounded by 9 Sanyo-tantalum capacitors. Are all SiS chipsets erratic at higher bus speeds? As long as you have some decent RAM and and quality peripherals the answer to that question is no. AOpen proves this statement with their AP58, the Sanyo-tantalum capacitors do account for some stability of the motherboard, however quality engineering and research come in to play with the production of any motherboard, it is quite obvious that AOpen did their homework with the AP58. 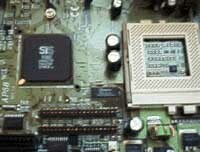 The motherboard is centered around the fairly large SiS 5582 chipset which is about the size of a small processor (i.e. 386DX). One trademark of SiS motherboards has been the green heatsink you find on almost all motherboards that use SiS chipsets, however absent for the SiS 5582 chipset in the case of the AP58 is this stylish heatsink. During normal and heavy operation the 5582 doesn't get hot at all, barely warm in fact, so it doesn't seem as if heat will be a problem for users. AOpen chose to keep a small distance between the 4 PCI slots and the 3 ISA slots, the Award BIOS chip is found between the first PCI slot and the last ISA slot allowing the user to fully occupy all 7 slots without worrying about any shared slots. For the size of the motherboard, it is amazing that AOpen managed to fit 4 SIMM and 2 DIMM slots on a baby AT form factor, nevertheless they did, and it was a great decision to do so. Configuring the Award BIOS to meet the test system's full potential is a breeze if you've had prior experience with the Chipset Features Setup of SiS motherboards, if you haven't however, the items in the BIOS may be quite frightening to you. Leaving the AP58 at its Turbo Defaults is more than sufficient for normal and overclocked operation, however if you feel like experimenting take a look at AOpen's thick user's manual. Why is the AP58's manual so big? Well, not only does it cover the basics necessary for setting up your system but it also documents the BIOS Settings very well. AOpen accurately documents many of the options in the Chipset Features Setup of the Award BIOS, something overlooked by 95% of the motherboard manufacturers selling their products today. Its nice to know that AOpen cares. The performance of the AP58 is a little better than Chaintech's 5SIM, however for the most part it can be classified as being average. What is really amazing is that the AP58 came in third place among the motherboards reviewed here at 291MHz with the Pentium MMX in the Socket-7 Motherboard Comparison. What's missing from the AP58? Inside AOpen's stylish box the Bus Mastering drivers from SiS seem to be absent along with AOpen's trademark copy of Norton Anti-Virus. It would have been nice to find the AP58 in an ATX form factor, but in order to keep the price of the AP58 at its targeted point the AT design was pretty much necessary. In the user's manual only one voltage setting is un-named, the setting is supposedly 2.1v which should be sufficient for the AMD K6/266 however I wouldn't count on it being too reliable with the K6/266 (requires a 2.2v setting) until we can find out for sure what AOpen made the reserved setting on the AP58. The manual states that this reserved setting is probably 2.1v, however that hasn't been decided for sure at the time the manual was printed...it all depends on what motherboard revision you got.